Rapnews.co.uk Rapnews.co.uk UK rap, grime and hiphop culture resource! » Blog Archive » DJ Format Competition! Win one of two goodie bags including the new DJ Format Album, the latest two singles and a dope t-shirt! MC Abdominal is one of two Canadian rappers on the new Format album. Who is the other? E-mail in your answer with your name and address. The competition is open to UK residents only, and it’s one entry per person. The winner will be chosen at random and notified on the 18th of July. Good luck! 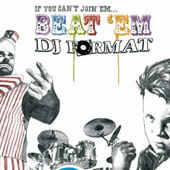 Be sure to check out the official DJ Format website as well as the fresh new video for new single ‘Separated At Birth’.